As the Golden Age of Illustration waned in the middle of the 20th Century, and color photography became the dominant force in magazines and newspapers, illustration itself, along with the rest of the art world, went through some major shifts. One of the pioneers of this changing landscape was Al Parker, an American illustrator and painter who got his break with a contest-winning illustration for a cover of House Beautiful. Parker would go on to make a career of creating dynamic, ground-breaking and precedent setting illustrations for magazines like Collier’s, Ladies Home Journal, Cosmopolitan, Good Housekeeping, McCalls, The Saturday Evening Post, Sports Illustrated, and Vogue. Parker started out of the traditions of the Golden Age illustrators, but was soon moving into modern, and modernist, territory. Rendered forms gave way to more and more stylized abstractions of shapes. Flat areas of color replaced modeling and design came to the fore. Negative shapes, the areas in an image around and between objects, became prominent. Parker became extremely popular and in demand. With packs of lesser illustrators nipping at his heels with imitations of his popular style, Parker kept changing his style, pushing into new territory and in the process defining mid-century modern illustration to a great degree. He once created every illustration for an entire issue of Cosmopolitan using different styles, and pen names, for each illustration. He was also influential on the generation of women who comprised a large part of his audience, making it a point to array his models in the latest fashions and helping to make those fashions part of the culture of the time. I was surprised that I didn’t find more of Parker’s art readily available on the web, considering how influential he was on a generation of artists (he was also one of the founding members of the Famous Artists School), but I did find a few gems. Paul Giambarba has come through, as always, with excellent illustrated posts about Parker on his terrific blog, 100 Years of Illustration and Design, with: Al Parker’s ads for American Airlines and Even more Great Al Parker Illos, and Leif Peng of Today’s Inspiration has an article about a illustrator Will Davis who had A Visit with Al Parker, and he has also posted a great Al Parker Flickr set and also has a page devoted to Al Parker on his site. Addendum: The curator at the Norman Rockwell Museum was kind enough to leave a comment on this post to let us know that the museum will be holding a major exhibition of Al Parker’s work, “Ephemeral Beauty: Al Parker and the American Women’s Magazine 1940-1960” from June 9 to October 27, 2007. Hey Charley – great to see you spreading the word about Al Parker! Its so important that that these fabulous illustrators not be forgotten. They paved the way for those of us who are privileged to carry the illustration torch today – yet so few of us have ever heard of them. Your efforts help reinforce their importance and help educate us all. Great job! Thanks, Leif. I didn’t make the connection from the blog or the Flickr page to your site, but I’ve gone back an linked it and added Today’s Inspiration to the lines and colors blogroll. Thanks likewise for your efforts to keep the work of these illustrators available. 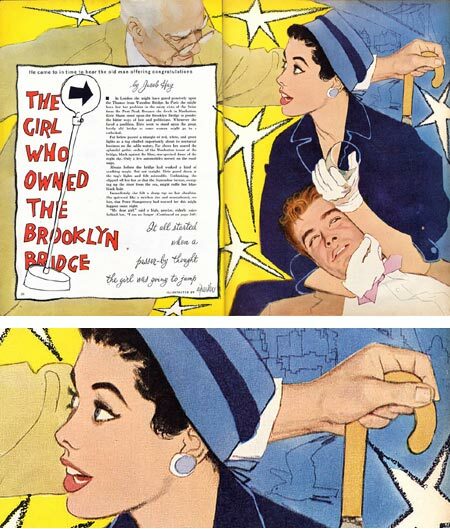 I particularly appreciate your mention of Austin Briggs, Noel Sickles and Stan Drake, terrific and underappreciated comics artists who also worked in illustration. Keep up the great work! Thank you for featuring the art of Al Parker on your site. I hope that fans will visit us at the Norman Rockwell Museum in Stockbridge, Massachusetts for a groundbreaking exhibition that honors Parker’s contributions. Ephemeral Beauty: Al Parker and the American Women’s Magazine will be on view from June 9 through October 28, 2007! Please visit our website at http://www.nrm.org for more information. I have the exhibition in the Exhibitions listing in the right column lines and colors sidebar, and I’ve added a notice to the main text of this post. I’ll try to write a new post about the show to help announce it when it gets closer. I think this will be an important exhibition about a major figure in American illustration. For those who want more detail now, see the Upcoming Exhibitions page on the museum’s site. Love Al Parkers work and that of his contemporaries from that glorious age of illustration. Glad to see this website for him.